Presenting Business Today’s league of extraordinary managers— 25 young guns, aged 40 or under, who are blazing a trail up the corporate ladder. By his own admission, Abraham Joseph did not expect to spend close to 19 years at Bajaj Auto. It was his first job as a campus recruit from the National Institute of Technology, Bhopal. “I was always passionate about motorcycles and joining Bajaj Auto was logical,” says the mechanical engineering graduate from the class of 1989. The early ’90s at Bajaj Auto were all about transforming from a scooter manufacturer to getting onto the motorcycle bandwagon. For every executive, there is a turning point in the career and for Joseph, it has clearly been the launch of the Bajaj Pulsar. The year was 1998 and the brief from Rajiv Bajaj was succinct. “He said we had to create something that was bigger than anything else. He wanted to create a cult bike,” recalls Joseph. The next few years till late 2000 were hard work, but as it turned out, hugely rewarding as well. “That was a fantastic phase and extremely challenging,” he says. 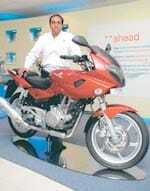 It was during this period that the R&D team at Bajaj Auto grew from an insignificant 10 people to a mammoth 350. The average age of that team is just 32. “What I learnt from the Pulsar experience was to always have confidence in oneself and in your team,” says Joseph. While Joseph himself thinks the Pulsar has been his biggest achievement to date, the DTS-Si (Digital Twin-Spark Swirl Induction) engine story has not been far behind. “We succeeded in building a brand around it,” he says. Without a doubt, Joseph’s interest in R&D is impossible to miss, though he admits that he has other interests apart from work. “I love rock music from the ’60s to the early ’80s. I also enjoy wildlife photography,” he says with a laugh. For now, the Bajaj Auto story is about R&D and the next five years promise to be hugely exciting. “You will see a complete transformation in the company. We have a very interesting pipeline,” adds Joseph. Clearly for this man, who is an unabashed admirer of BMW, the years to come will be a lot of fun.